Valve reveals some impressive details on the massive RPG's "spectacular launch." According to Valve, Skyrim has officially sold mores copies in less time than any other game to ever use the Steam platform. The record is but one component of what's proven to be a release as massive as the game itself. ZeniMax has reported that aside from what it describes as "record-breaking digital sales," ten million physical units for the Xbox 360, PlayStation 3, and PC have already shipped, representing approximately $650 million in retail sales. 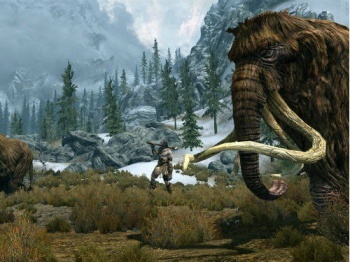 "Bethesda's commitment to and understanding of the PC as a gaming platform shows in the great review scores, spectacular launch, and continued high player numbers that Skyrim has received," said Jason Holtman, director of business development at Valve. "We are delighted that Bethesda chose to use Steamworks to support Skyrim both at retail and digitally." During its release month of November, the game's PC version outsold any other game available by a ratio of 3:1, and earned some of the highest critic reviews of any released all year. "We are gratified that Skyrim continues to garner high review scores and accolades around the world," said Robert Altman, CEO of ZeniMax. "We are most grateful to our fans for their support and enthusiasm for the game, and their love of the hundreds of hours of gameplay it offers. We continue to strive to deliver the highest quality entertainment experience for everyone." If you're someone who's thus far enjoyed traveling the cold, harsh region of Skyrim then you'll be happy to hear that next year (which is right around when you'll likely be able to finally finish) Bethesda has even more plans for Dovakhiin. "2012 will be another huge year for our fans, with the release of the Creation Kit," Altman said, "as well as exciting DLC which will add to the richness of this epic adventure." Both the Creation Kit and whatever DLC is in store for gamers should do even more to spark what's already become a lively modding community.